Top Layer: Madagascar Vanilla Cake with Roasted Peach and Strawberry Filling. All covered in a Vanilla Buttercream (French style). Served: Intended to serve 100, it way overshot. However, leftover yummy cake was enjoyed by many, I’m given to understand. The fence and plaque were made from gumpaste and hand-painted, and the sand was graham cracker crumbs. The mother of the bride contacted me secretly about making a groom’s cake for her prospective son-in-law – he went to the University of Maryland, so we decided that something turtle-themed would be appropriate. I found the nifty cupcake toppers at Art Design Store, and they shipped them immediately – so no worries about them getting here in time! The cupcakes were Devil’s Food Chocolate, filled with caramel-pecan gooeyness, frosted with caramel frosting, and the edges rolled in toasted pecans. The toppers eventually sort of meld with the frosting (no fondant here! ), and other than a slight gumminess were hardly noticeable. Don’t they look happy with their cake? Of course, the hard part was over (the wedding) – well, mostly over. There were some problems with the room the reception was supposed to be in, and some other last-minute stuff – but all was handled gracefully and in the end, everyone was happy. Well, everyone except the folks who ended up with swine flu — one of the aunts was diagnosed with it two days after the reception, and a few people ended up with it, including the happy couple. Oops. But hey, that’s what makes for great stories to tell your grandkids, right? Been doing some of this, some of that. After the great Pie-xtravaganza (20 pies in two days), I didn’t feel like doing much of substance, but ended up taking too many desserts to Thanksgiving anyways (five people don’t really need a full 8″ bourbon pumpkin cheesecake, 6″ x 6″ carrot cake, and 6 mini-chocolate peanut butter mousse tarts). First up, the carrot cake. I decided to go with a recipe found on Epicurious, the Triple Layer Carrot Cake with Cream Cheese Frosting. I’d had an order for a carrot cake, promised four layers, so I figured that if I made two full-sized layers and split them, I’d be good. But I had batter left over! So I made another 6″ layer, figuring I’d get to try it. The raisins in this came out tasting as though I’d soaked them in Grand Marnier for a month. But I hadn’t! Straight up out of the bag. 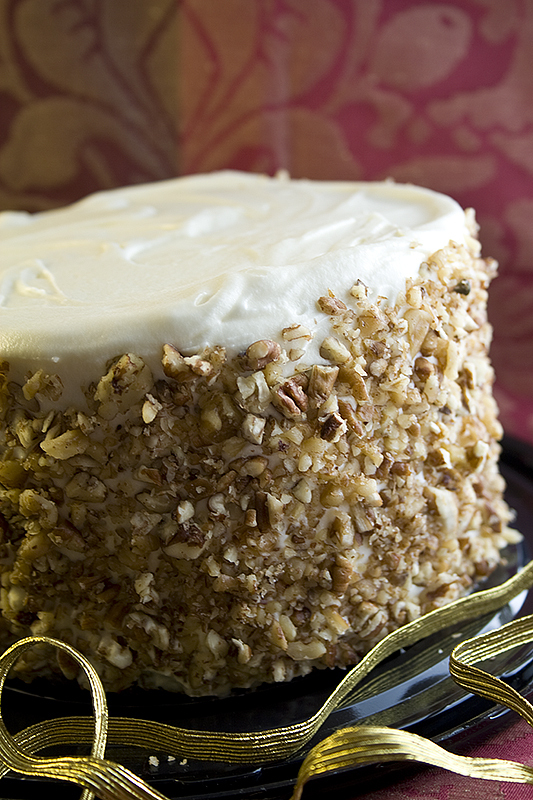 This is a tasty, tasty cake and makes an excellent breakfast (ahem) as well as dessert. Oh, I spiced the frosting up with a little orange extract, it seemed to want it. 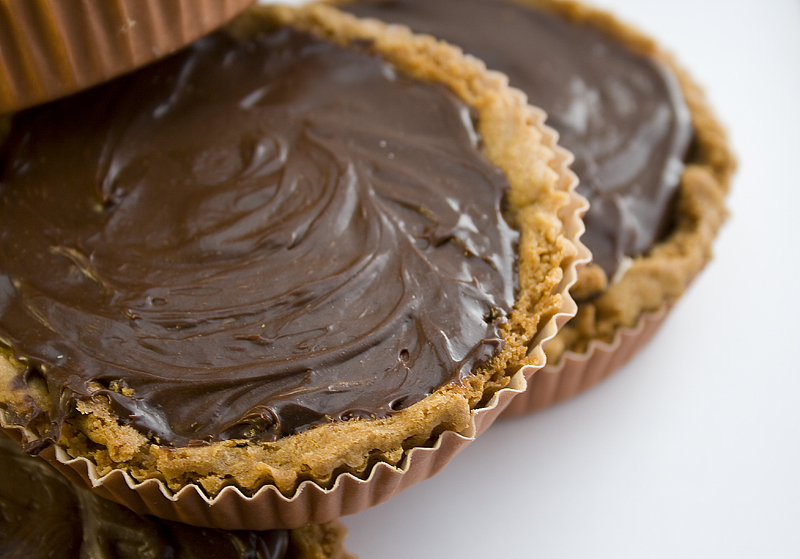 Mini Chocolate Peanut Butter Mousse Tartlets. Nothing there but sugar, water, butter, cream, and pecans (and a little corn syrup). Swoony yummy. 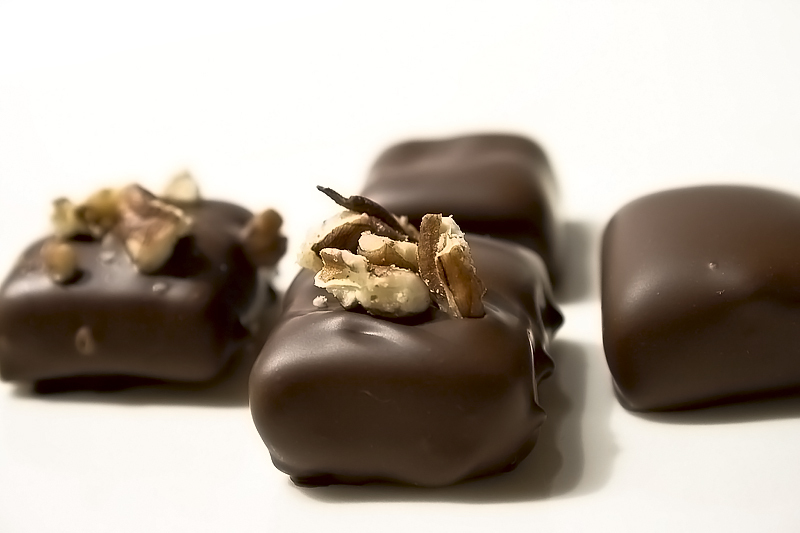 The recipe I use for these came from Greweling’s chocolate confections, a book I cannot recommend highly enough if you ever intend to take making confections seriously. It’s amazing. Hmm, what else is lurking about…. Oh, I tried making some chocolate tartlets a while back, but although they were tasty, they were very dark, and I think most people would find them too dark for enjoyment. 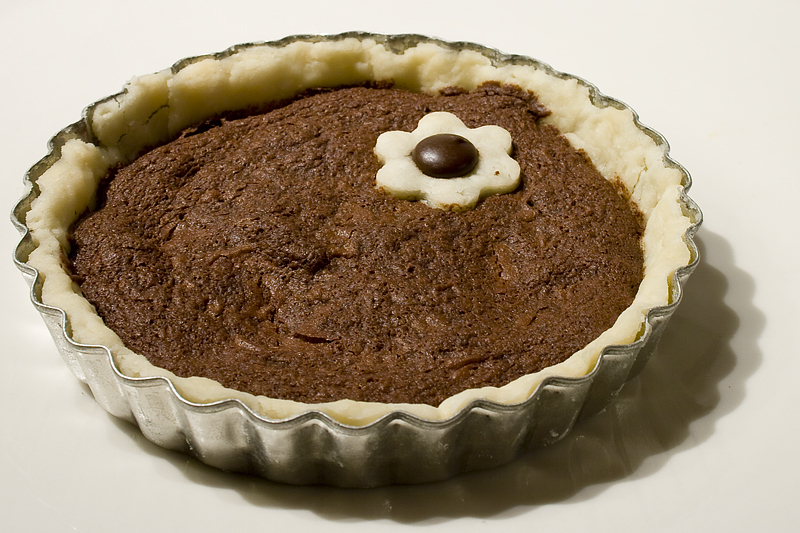 This recipe came from Rose Levy Beranbaum’s Pie and Pastry Bible, another must-have. Place sliced caramels in crust. Place sliced apples over it. Bake at 350F until done (apples are softish and caramel is bubbly), about 20 minutes? Tasty as all get-out. And that’s what I’ve been up to – oh, other than trying some gingerbread cookies using my old springerle molds (although I didn’t find that they kept the impressions after they baked – any ideas? ), but I didn’t get pictures of that. Tasty, though! What are all of you up to? 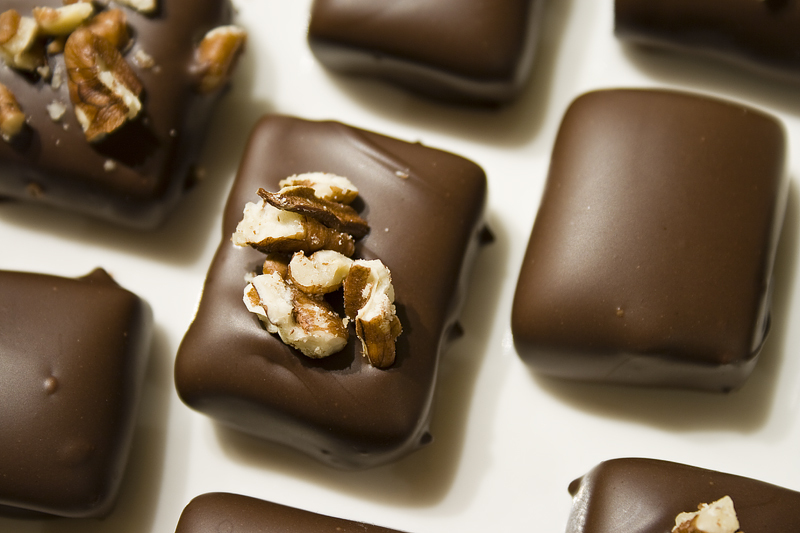 Along with baking, I love making confections, especially chocolates. It’s the right combination of fussiness and artistry, and people *always* love the results, even when it comes out poorly. I’ve had a love-hate relationship with caramels for years. I started trying to make them after I moved to North Carolina, and they would just never come out. Hard as a brick, every time. I even had Tammy of Tammy’s Tastings sit down with me and show me how she made caramels, and walk through it every step, and when I went back home and did it myself – brick. Tasty brick, but still, brick, and with using local cream at $3/pint, not cheap to make at that. So, every few months’ I’d try it again, changing something else. The first thing I changed that seemed to help was in getting to a darker color during the first heat (when caramelizing the sugar/corn syrup, before adding the butter and cream). Contrary to common sense, the darker you make your initial caramelization, the softer the resulting caramel. I’d been going in the other direction, working with lower and lower temperatures to try and get something that wasn’t the world’s stickiest brittle. So that helped, but it still didn’t get me all the way there. I then figured that maybe I was losing too much moisture somewhere in the adding cream step. The local cream is really rich, and when pre-heating it to the boil it gives off a lot of moisture – so I started making sure I had the right amount left after heating. I also figured that I might be taking too much time to come to temperature after adding the cream (and therefore heating away moisture), so I started re-heating the cream just before adding it to the caramel. Closer, but still not entirely there. The final tweak that I made that seems to have done it for good was that, after pouring the caramel into the pan I use to cool it, I cover the top with press ‘n seal (not touching the caramel, just sealing it off from the air). Either it was taking on too much moisture from the air (it is sort of humid here in NC), or losing too much – I still don’t know, but that combination of steps has finally led to me consistently achieving perfect caramels – soft and chewy yet holding their shape (mostly). Now that I have achieved caramel nirvana, I can start playing around with it! For a while, I’d been sticking with my old favorite (lavender-infused fleur-de-sel caramels), but I was inspired by autumn to try and come up with something more.. autumnal. 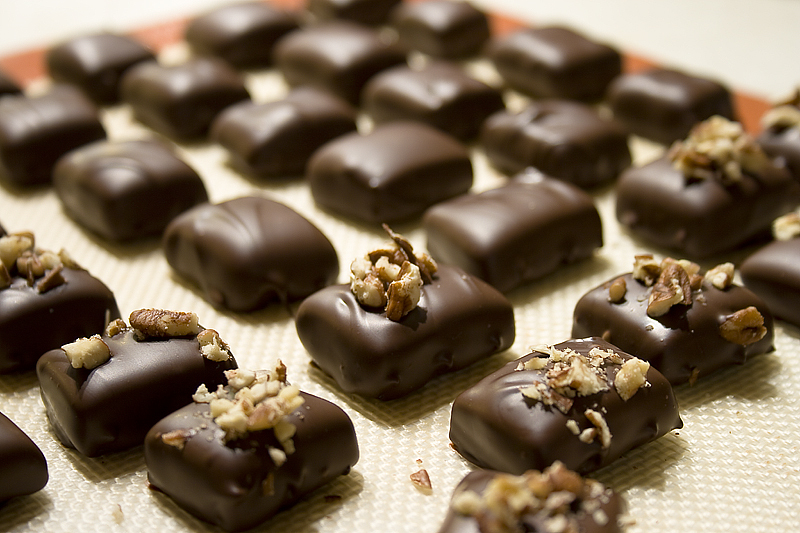 So, back to Tammy for the recipe for apple cider caramels, and a few tweaks later, and YUM! [My final step: Cover the pan with plastic wrap, not touching the caramel (it’ll melt)]. Wait until entirely cooled. Then cut with a sharp, oiled knife into pieces. 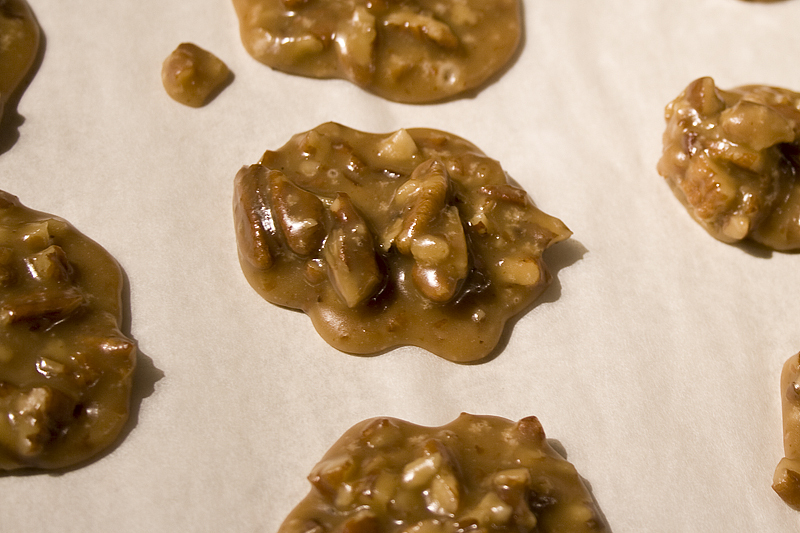 These caramels, made by the recipe above, basically tasted like a caramel-dipped apple. But why leave it there? Jeff suggested brushing on cinnamon, and that was really tasty. So we did that. 🙂 I wrapped about half of them in wax paper, and dipped the rest in tempered dark chocolate (70% Callebaut), sprinkling half of those with toasted ground pecans. Because Caramel dipped apples are even better with chocolate and nuts, in my opinion! Reviews have been great so far! Hopefully, some will survive to go to work tomorrow. It’s fall, right? I thought I’d give the pumpkin a break for a bit and try the other fall favorite, apple cider. This recipe comes from Coconut & Lime – and really, there’s not much to add! 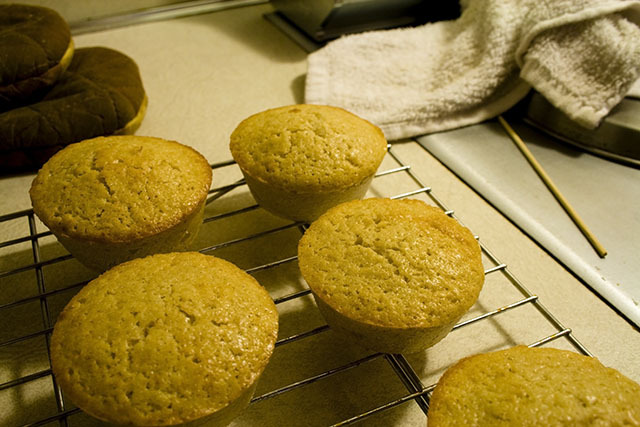 Made as directed, the cupcakes came out feeling a little heavy, but they lightened up as they cooled off. 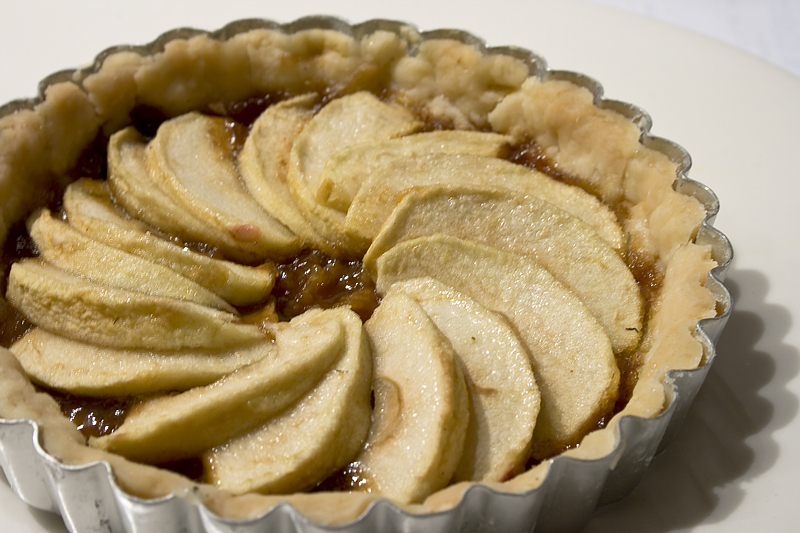 Perfect crispy crust edges, soft interiors, with the flavor of apple cider permeating throughout. Preheat oven to 350. Grease or line 12 cupcake wells (I used a silicon baking pan, with a mist of pancoat). In large bowl, cream together butter and sugar. Add eggs, one at a time, beating well after each addition. Sift together flour, baking powder, cinnamon and salt. Add 1/3 of the flour mixture to the butter/sugar mixture, then 1/2 of the cider, and repeat, ending with the last of the flour and mixing only until incorporated. Pour into prepared cupcake pan, filling each cup 3/4 way full. 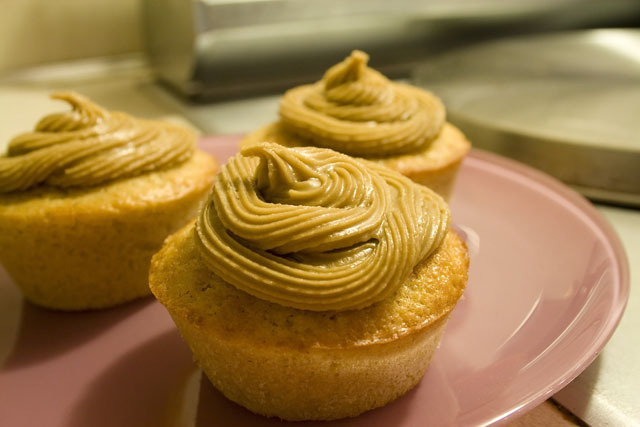 Bake 20 minutes or until a toothpick inserted in the center of the center cupcake comes out clean. In a medium saucepan, melt the butter then add the milk and brown sugar. Bring to a boil and continue to boil for 1 minute. Remove from heat, and whisk in 1/2 cup confectioners’ sugar, sifting it into the pan to avoid lumps. Cool slightly, then very vigorously* whisk in the remaining 1/2 cup confectioners’ sugar (or less – I used the entire cup and I felt that the frosting was too thick). Frost cupcakes while the frosting is still slightly warm. *if you have problems doing this by hand, use an electric mixer, it is very important to whisk very quickly or it will not be smooth.